The ground is white, the sky a deep bright blue, the trees glisten and the air is crisp. . . it is winter in the Cariboo Chilcotin of British Columbia. Welcome to this wonderland of winter fun. There are places to visit and outdoor recreational activities to enjoy. A popular winter past time in this region is the joy of cross country skiing aka Nordic skiing. The local fields and meadows give cross country skiers a variety of trails and scenery. From the novice to the experienced, cross country skiing in the Cariboo Chilcotin is affordable family fun. Hit the trails in local fashion, where the emphasis is on fun, family and friends. Welcome to cross country skiing in the Cariboo Chilcotin. 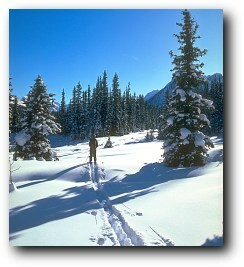 The Cariboo Chilcotin is a haven for cross country skiing. This region of BC is well known for an extensive network of hundreds of km of cross country ski trails in twelve different areas. Winter snow turns this region of the province into a picture perfect playground. The rolling hills, mountain forests, meadows and many lakes are ideal for cross country skiing. The terrain provides trails ideal for the classic skiing or the newer and faster skating technique. Ski trails vary from marked and groomed ones to wilderness treks, and you can also enjoy ski touring in BC's Cariboo Mountains and in the Chilcotin. There are dozens of resorts and communities that cater to the winter visitor. Discover the joys of a Cariboo Chilcotin winter, with a visit to this vast and beautiful part of BC.